David Buchanan admits the Cobblers’ inability to make the most of their opposition being reduced in numbers is a source of great frustration, but felt the performance in the 2-2 draw at 10-man Notts County was at least a step in the right direction. In their past two games, Town have played half a game against 10 men with opposition players being red-carded. Port Vale came from behind when at a numerical disadvantage to win 2-1 at the PTS on March 30, and then last Saturday the Magpies recovered from 2-1 down to claim a share of the spoils. 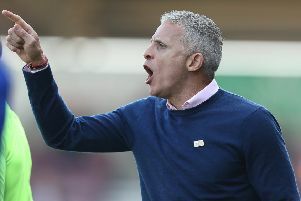 Earlier in the season the Cobblers also failed the make the most of Lincoln City having a man sent-off in the first half, drawing the league two clash 1-1. 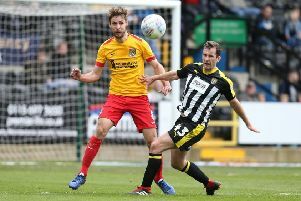 All three were big opportunities missed by the Cobblers, and in particular the latter two, but Buchanan felt the performance in the draw at Meadow Lane did at least show a big improvement on the loss to the struggling Valiants the previous week. “When any team goes down to 10 men it is always disappointing when you don’t win the game,” said Buchanan. “But I think the manner of the defeat on Saturday was, not acceptable because we wanted to win the game, but we went about it the right way. “We kept knocking on the door, we kept getting the ball wide, moved it quicker and got the ball into the box and created plenty of chances. “The set-pieces we worked on in the week worked a treat, and the free-kick routine was nearly perfect. “We have been a threat from corners all season, but ultimately you have to put the ball in the next and when you are chasing the game and when they go down to 10, it is all about concentration. “But on the whole I feel it was a much more positive. But he then added: “Playing against teams going down to 10 men hasn’t been favourable for us this season. “We managed to only get a point at Lincoln when they went down to 10 men, and then we got beat by Port Vale, but I thought on Saturday we were dominating the game with 11. “Then when they went down to 10 we moved the ball a lot better and created numerous chances, and it was just really lapses in concentration in our own box and, more importantly in their final third.